The exhibition presents a collection of painted Masurian folk tiles. 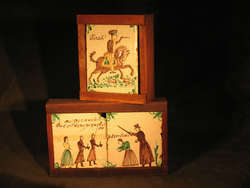 They come from various tile workshops active in Masuria from the late 18th to mid-19th century run, among others, by the families of Karpowicz of Nidzica, Nadrowski, Moczadło of Pasym or the Salewski family. The origin can be deduced from the so-called company tiles marked with the manufacturer's name and date.